In war, ground to air AA defence is a very necessary but very difficult skill. It is vital in military operations to be able to defend yourself from air attack, or carry out an attack of your own on another aircraft. As early as World War 1, German airship gunners streamed a small parachute behind their airships and practiced shooting at it. However, whether you are on the ground or in the sky, shooting accurately at a flying aircraft is incredibly hard. You have to aim at a point ahead of the plane, so the plane and shell or bullet arrive at the same point. It is called ‘aiming off’ or ‘deflection shooting’ and takes a lot of practice. 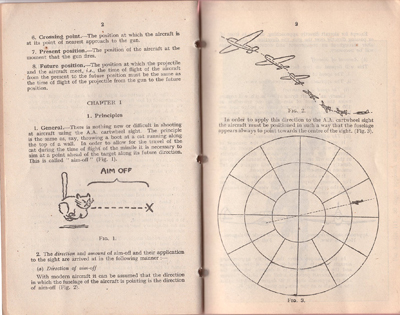 Except from Volume 1, Pamplet No.6, Supplement No.1, Cartwheel Sight (UK, 1943). By permission of Vickers MG Collection and Research Association.